Urban Archeologist: Some stuff you find - Some stuff finds you. I have always wanted to publish a line of bumper stickers. It doesn't sound like a noble cause, but I often don't know how to better express my observations of the world around me (Blog posts are too long for bumper stickers, I know). The bumper sticker for this post would read: "Coincidence Happens!" There isn't always a good explanation for the things I pick up. Sometimes it is purely based on coincidence, which has occurred while performing random ac ts of Urban Archeology. I was visiting a local flea market at a time when the marriage of two friends was imminent. I had no intention of going to the flea to shop for a gift, they weren't registered there. Although years later when I suggested to my fiancé that we register at the Elephant's Trunk Flea Market, she failed to see the humor in it, unless rolling one's eyes is some deep expression of amusement. 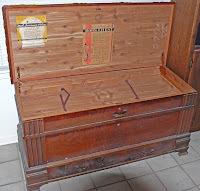 As I went from booth to booth looking for nothing in particular I walked by a cedar chest with the lid open. Maybe it was the condition of the advertisement on the lid that caught my eye, but the manufacturer of the chest was the same as the the groom's. That floored me. Thinking that I had found the perfect gift, I became concerned that my face had transformed into a neon sign flashing, "Charge Me Double, I'll pay it!" I didn't have too much cash on hand, so I attempted to feign disinterest and asked the dealer, "How much for the chest?" His price was high, so I thanked him and walked away. I would take the chance that no one else would consider this the perfect gift, and planned to circle back later. Time was running out, the flea doesn't go on all day and many dealers begin to wrap it up after the morning rush, on top of that, the sky was becoming overcast. I returned after exploring another section to hover around the booth. I was too cheap to give in and feared that the next haggle could be my last. I really wanted this chest as much as I wanted to be finished gift shopping, but I couldn't figure a strategy. I finally dove in with my price and was disappointed when the dealer countered by dropping only $20 off the price. I twisted in the wind that had kicked up, and felt a drop of rain hit my head. Somewhere behind me I heard a collective groan from the dwindling crowd and the dealer left me to begin covering his other pieces of furniture. "Tell ya what, will you take $__ if I help you load your truck before the rain gets here?" He paused for a second and said, "Deal." and tossed me an old blanket to cover the chest. I had seized an opportunity and named a price I could afford in exchange for 5 minutes of hard labor. The year is 1983, how strange is it to just happen across correspondence from the author I was reading at the time. Karma? Kismet? Serendipity? It is amazing that an envelope from 1971 would last as long as it did in such an unremarkable location - 12 years in a folder. On top of that, the book also has a publish date the same year as the letter. This is where I get philosophic and pose the question: Did I find it, or did it find me? You decide, I was too weirded out.